Yoga classes are great. They are an excellent opportunities to learn, meet people, and unwind. And the shared energy is so powerful. But we mustn’t neglect our need for solitude. It is important that we develop the skills and confidence to practice at home or wherever we are, so that we don’t become too reliant on the classroom. 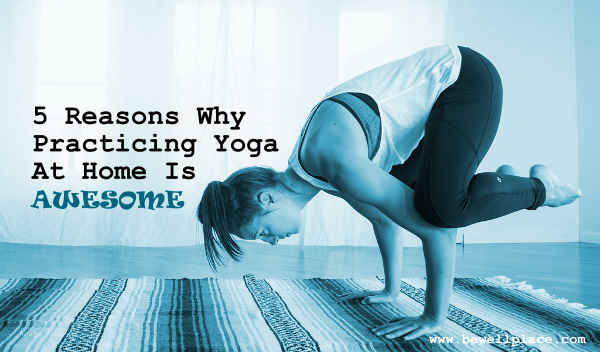 Personally, I believe that home yoga is the key for internalizing the philosophy such that it transcends into every corner of our lives. Yeah, I went right for it. And don’t even try to deny this one. All that twisting and bending…part of the point is to improve digestion and get our systems flowing. But we usually deem it impolite and embarrassing to let ‘er rip during class; so we abstain, which defeats the purpose of the twisting and bending. And as the saying goes, if a yogi toots in her living room and there’s no one there to hear it, does it make a sound? Let’s face it, yoga classes are expensive. Yeah, we can milk all the Groupons and new student trial months, but even discounted rates add up quick. Why spend an arm and a leg every week when we can practice for free at home? Are we really going to go to yoga class every day at 5am before work? How about every day at 5pm after work? Sometimes, even once a week can be a challenge for busy people. Going to and from the yoga studio adds precious minutes to our commute time. And although yoga is more popular these days, it’s not like there’s a studio on every block. Why stress about making it to a class when we can practice anywhere at anytime? Eliminating the commute can add 20 to 40 minutes of actual practice time, which is a much better use of our limited minutes. Sometimes the days get filled up with unexpected meetings and last-minute tasks. Sometimes we get snowed-in. Sometimes we get sick or have to stay home and wait for the plumber to come by. None of this means we have to skip our practice. We can always sneak a quality 20-minute session in, but there probably aren’t any 20-minute classes offered nearby. However, there are plenty of quick, free online videos available when some guidance or inspiration is needed. When we’re at home on our own, we don’t have to follow anyone’s instruction or keep pace. We can move however our bodies want to move, speeding up or slowing down based on our mood or needs. At home, we can freely express ourselves and make our practice our own. We can transform our personal space into an energy haven to calm us down or spruce us up based on our needs. And sometimes it’s just nice to not have to coordinate with anyone else and do you. If you’ve been to any yoga classes, you probably learned more than you realize. Try to mimic the classes you attended by playing music, lighting candles, or darkening the room. Whatever your teacher did to set up the environment, try to emulate it in your own space. And definitely put your own personal flare into it. Don’t stress out if you don’t remember every single thing your teacher showed you. Just think back to a couple poses that really resonated with you and start there. Practice flowing in and out of those poses, holding them for various time periods, elongating the spine, aligning the hips and knees properly, and of course breathing.